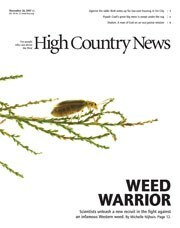 Scientists unleash a new weapon in the fight against invasive tamarisk – a tiny exotic beetle from Kazakhstan. Lincoln Bramwell looks back on years of firefighting and concludes that it’s just not a good idea for people to keep building houses in forests. Lucky the elk was not so lucky; unhealthy health treats; little kid literally drives folks crazy; 90-year-old volunteer finally retires; stories about heat raise temperatures; Tahoe’s bear troubles. In Las Vegas, the Bureau of Land Management offers up cheap land for affordable housing. Recent elections in the West show support for land-use planning and “convergence politics”; hunting declines in the West, but Satan keeps busy in Idaho, causing divorces.